Adaptation of disgraced broker Jordan Belfort's auto-biography. In the mid-eighties, Jordan Belfort (DiCaprio) works his way up the ranks of a Wall Street brokerage firm until the "Black Monday" crash of 1987 leaves him out of work. When he takes a job at a low rent firm selling penny stocks of little or no value, he discovers a not altogether legal, or ethical, way of making easy money: misrepresenting the value of the stocks to his clients. 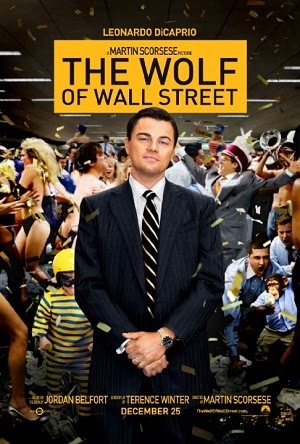 Seizing the opportunity, he goes into business with a group of friends and his firm quickly rises, earning Belfort the nickname "The Wolf of Wall Street" as he becomes a multi-millionaire. His meteoric rise, however, attracts the unwanted attention of FBI agent Patrick Denham (Chandler). "This yarn is not materially different from other Wall Street tales that have come to the screen," wrote New York Times critic Mordaunt Hall, "Money there is, also madness, women and swindling." He was writing, of course, about the 1929 The Wolf of Wall Street, but his words can be comfortably appropriated for Scorsese's latest DiCaprio collaboration, not a remake of Rowland V Lee's film, but an adaptation of an autobiographical work by the disgraced broker Jordan Belfort. Much has been made of whether the film glamorizes Belfort or not. In adapting a book penned by his film's subject, Scorsese faces something of a no-win situation. Some have criticized the director for not showing us the victims of Belfort's illegal enterprise but the fact is Belfort and his minions never encountered them beyond phone calls, part of the reason so many people were able to commit so many crimes without losing sleep. Should Scorsese have included Belfort's victims? Personally, I don't believe so. It's plain to any moral person that Belfort is screwing over a lot of people and to present us with montages of homes being repossessed would represent a dumbing down by the director of a film that already suffers from exposition issues. You might argue that the problem isn't how us moral people perceive the film, rather those without any ethical grounding, but if every film-maker had to factor in the effects their work might have on the narcissists and sociopaths of this world, there'd be very few movies available for us to watch. In the case of The Wolf of Wall Street, copycat behavior is highly unlikely, especially in the current economic climate. There once was a time, the seventies they called it, when respected film-makers were given a free reign by the suits of Hollywood. It's how highly uncommercial, personal pet projects like Kubrick's Barry Lyndon, Cimino's Heaven's Gate and Scorsese's New York, New York made it to the screen. That era is long gone, for better or worse, and now even Scorsese finds himself at the mercy of the money men. TWOWS was originally marked for a Spring 2014 release until some bright spark decided it should be rushed forward to qualify for the 2014 Academy Awards, even though nobody believes it stands a realistic chance against the Oscar behemoths of Gravity and 12 Years a Slave. Thus, Scorsese's post-production timeline was cut by a full two months and the result is a three hour film that plays like it should run for either two hours or four. Supporting characters are given sweeping introductions that create the impression they're going to play a large role in the story, only to largely disappear for the rest of the film; Belfort's father (Reiner), his second wife (Robbie), and his nemesis, Agent Denham. Rumor is rife of a four hour cut, which would have meant releasing the film in two parts, a luxury only Tarantino and Von Trier seem afforded. Watching TWOWS you can't help feel this is a story that would be better served through the long form TV format, allowing more time to flesh out the supporting characters. For all Scorsese's camera wizardry, the film's best scenes simply feature people sitting or standing around, thanks to some crackling Sorkinesque dialogue from writer Terence Winter. The highlight is the moment when Agent Denham first meets Belmont. It plays like a scene from a classic Columbo episode, with it's smarmy upper-class villain miscalculating the abilities of the working class gumshoe on his case, and I wish we had seen more of these cat and mouse confrontations. It will be interesting to see how different this film is when it receives a home video release later this year, as I'm sure the version playing in theaters isn't the one Scorsese would prefer us to see. Until then we can only judge the film on what we get here; an enjoyable but messy three hour romp featuring what will likely become DiCaprio's signature performance, and a return to form for a director who has struggled to find a footing in recent decades.